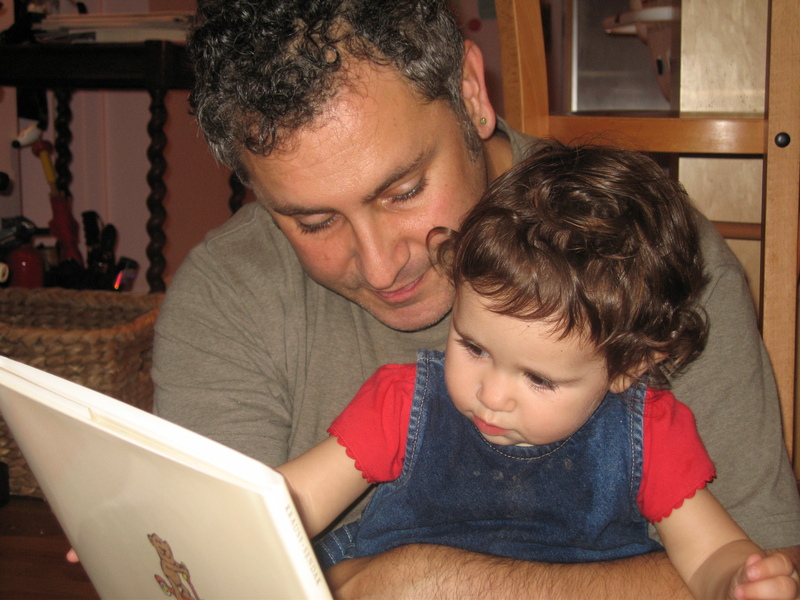 This week’s Tablet magazine column is about the importance of reading aloud to kids. I’ve been down on my last few Tablet columns, but I like this one. And today happens to be Dr Seuss’s birthday (when lots of delightful librarians and educators are doing Seusstastic crafts and storytimes), so tonight I will be sure to read The Sleep Book or The Sneetches (the two hits in current rotation) to Maxine when Josie is at play practice. Some of the bedtime read-alouds that have worked for both girls (ages 6 and 9) recently: Turtle in Paradise (so good! so deserving of its Newbery Honor! ), Al Capone Does My Shirts (waaah, hate the new cover! but SUCH a great book for reading aloud! ), Al Capone Shines My Shoes (whew, at least the hardcover still has the original, BETTER cover art and font, and it’s that rare sequel that’s as good — or NEARLY as good — as the original), Cosmic (I am NUTBALLS about this book, which could be considered a “boy book” but it worked for all three of us ovaried lit-lovers, and I already plotzed enough about this book on Goodreads that I better stop) and A Crooked Kind of Perfect (which I also loved up on Goodreads — Maxie really was a little too young for this, but Josie was right in the sweet spot). And you really should watch the video of the President reading Where the Wild Things Are to kids. (Pretty different from his predecessor reading My Pet Goat.) Dude knows how to read aloud. And I love the way Michelle orders him to turn the book so that the kids on the edges can see the pictures. 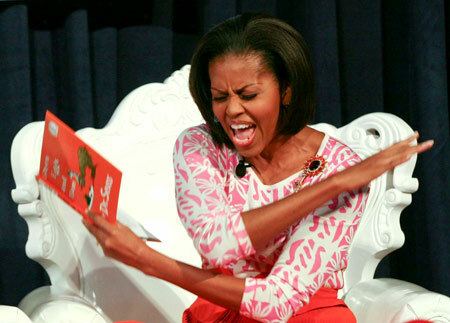 I hope there will eventually be video online of Mrs Obama reading The Cat in the Hat at the Library of Congress earlier today. I hope she wore red and white! UPDATE, 3/4: She read the Cat in the Hat to kids at a bilingual elementary school, accompanied by the first lady of Mexico. Mrs. Obama wore a black patterned peasant dress by Sophie Theallet — very attractive but not very Seussian. She read Green Eggs & Ham at the Library of Congress event, and wore a pink and white squiggly scoop-necked shirt with an orange pleated a-line skirt and (I think) a black and red flower pin. The outfit felt VERY Seuss-y, and the skirt matched the cover of the book exactly, and look how she reads with expression! First Lady FTW! Excellent column, Marjorie! I loved our Wild Things president. He IS a great reader, and a lovely dad. I also loved your earlier piece on God loves Poetry. I really needed to read that one after yesterday’s supreme court decision. Cross your fingers for my daughter Madeline, she just applied for an online internship with New Moon magazine, out of Duluth Minnesota. Madeline (who you interviewed for an earlier article ) graduates from Agnes Scott College in May. Are you familiar with New Moon? Your girls will enjoy it in a few more years. Yay books! I’ve been on a major kid lit streak lately but haven’t read any of these you recommend. Librarian hat off. As always, thanks for writing! I haven’t read New Moon in years — I thought it was kind of…earnest? incredibly well-meaning but lacking…immediacy? (in other words, the opposite of Madeline!) if you think it’s great, though, i will check it out. and i hope she gets the internship, and CONGRATS on having an impending-college-grad daughter! laura, i hear you — i have often thought i should link to the indie web site. i appreciate when other writers do that. but i find the interface of worldcat confusing, personally, and want the immediacy of BUY THIS instead of having to click more than once. i am a huge supporter of libraries — somewhere on the blog is a letter josie wrote to mayor bloomberg demanding no cuts in library hours. as a writer, tho, when someone says “i got your book out of the library!” my heart sinks. i want the money! buy my book!